Before the bride and groom got married at Chateau Le Parc, they sent a letter to each other in which they expressed their love and thoughts before tying the knot. As a Toronto wedding photographer, I learned that I had to deliver extraordinary photographs to my clients in order to earn referrals and grow my business. As such, I have always been searching for techniques that allow my imagery to stand out. Among them, my favourites are creating interesting lighting scenarios, building a beautiful composition, focusing on the moments and capturing the love apparent on the wedding day and so on. One of the techniques that is often disregarded in wedding photography is removing the subject out of the context for artistic effect. What do I mean by that? For example, instead of photographing the full body of the bride and groom, the best wedding photographers capture only the hands of the couple. Some of my favourites are the hand of the beautiful bride touching the groom's face, the couple's lips almost touching in a passionate kiss of love and many more. Often, on the big day, there is no time for creativity so I often create a storyboard before the special event and on the wedding day, I execute it. 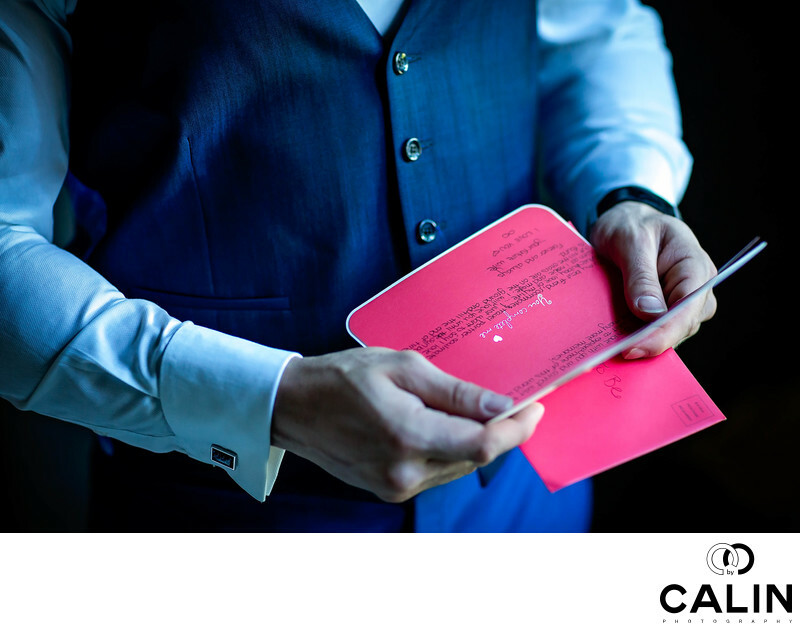 In this image, we can see the groom's hands holding the card from his wife to be. We can discern the text in the letter though just a few lines to increase the mystery increase suspense. Chateau Le Parc is a splendid venue that includes unique architectural and design elements appropriate for this technique I described above. a Canon 5D Mark III camera and an 85 mm F1.2 lens. To be able to make the text legible, I shot the image at F5.6. I often see professional wedding photographers taking pictures of text at F1.2 and I consider that a big mistake is only one or two words are in focus at such shallow depth of field. Yes, I agree that if you want to focus the viewer's attention to one or two important elements of the scene one can use such wide open aperture, but in general, shooting wide open renders the image unusable. In post-processing I made sure that the colours are accurate, adjusted the levels and curves, sharpened the image and perform some serious skin softening and selective vignetting.